Cunningham | Quill was honored to receive two of the thirteen awards presented on Wednesday, May 6 at the 2015 District Awards for Excellence in Historic Preservation. Sponsored by the District of Columbia Historic Preservation Office, this award program honors significant contributions made by individuals, organizations, and businesses promoting historic preservation in the District of Columbia. 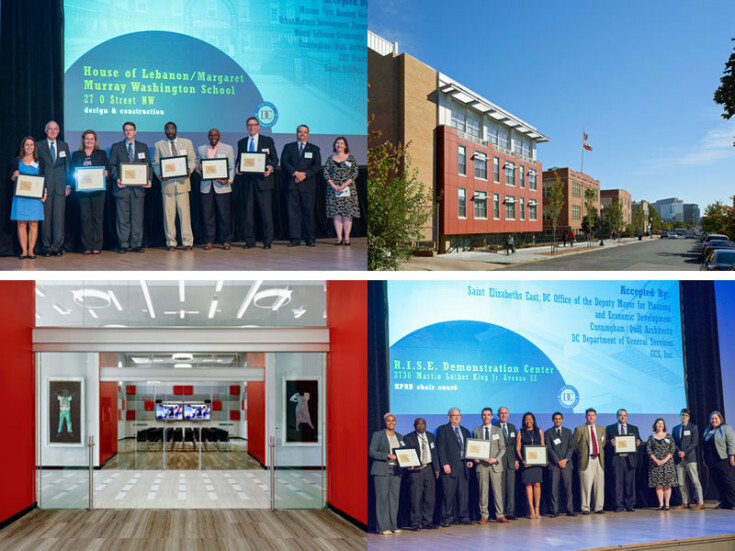 We were very pleased that our teams were among the 2015 awardees! The R.I.S.E. Demonstration Center at St. Elizabeths East Campus received the 2015 Historic Preservation Review Board Chair’s Award for Excellence in Historic Preservation. R.I.S.E. Demonstration Center is the adaptive reuse of the former St. Elizabeths Chapel, converting the building into a new center for community and technology. The project was nominated by Cunningham | Quill; Saint Elizabeths East and the DC Office of the Deputy Mayor for Planning and Economic Development; the DC Department of General Services; and GCS, Inc. More information and project photos can be found here. The House of Lebanon (Historic Margaret Murray Washington School) was honored with a 2015 Award for Excellence in Historic Preservation for design and construction. The conversion of the Margaret Murray Washington School into 82 affordable apartments for seniors in the Shaw neighborhood of DC included the restoration of historic portions of the school and the renovation of a 1970s addition to unify the complex. The project development team included Cunnigham | Quill; Mission First Housing Group; Urban Matters Development Partners; Mount Lebanon Community CDC; EHT Traceries; and Hamel Builders, Inc. Project photos and more details can be found here.